PASCAGOULA, Miss., Feb. 14, 2008 (PRIME NEWSWIRE) -- The Northrop Grumman-built (NYSE:NOC) National Security Cutter (NSC), Bertholf (WMSL 750), returned Monday after four days of builder's trials in the Gulf of Mexico. The ship's return to Northrop Grumman Shipbuilding's Gulf Coast Operations here marks the latest milestone for the first NSC, which is nearing completion. "Bertholf's builder's trials validated what we have believed for sometime," said Richard Schenk, vice president and general manager for U.S. Coast Guard programs for Northrop Grumman. "The team has designed and built a ship that has exceeded expectations with respect to performance and operability. We look forward to completing Bertholf and delivering a vital asset to the Coast Guard." "When you combine this extremely capable cutter with our high performing crew, you have a recipe for legendary achievement," said U.S. Coast Guard Capt. Kelly Hatfield, prospective executive officer of Bertholf. "We are building the legend one step at a time. The latest step was taken during builders trials with the successful first ever firing of the 57mm gun from a U.S. ship." During the trial, extensive testing of propulsion, electrical, damage control, and combat systems was conducted. This culminated in the successful completion of a four hour full power trial, standarization trials as well as 57 mm gun and close-in weapon systems. This is the second round of sea trials for Bertholf, which completed machinery trials in December 2007. The NSC started fabrication in September 2004 and was christened at Northrop Grumman's Pascagoula facility in November 2006. 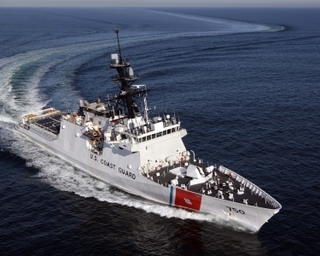 Bertholf will complete final trials later this spring before delivery to the Coast Guard. The NSC is a 418-foot vessel with a 4,300 ton displacement at full load powered by a combined diesel and gas turbine power propulsion plant driving twin screws with a maximum speed of 28 knots. The cutter includes an aft launch and recovery area for two rigid hull inflatable boats, an expansive flight deck able to accommodate a range of rotary wing manned and unmanned aircraft and state of the art command and control systems. In addition, the cutter features improved habitability and a sailor-centric design to facilitate optimized crewing and, enhance onboard quality of life for a mixed gender crew.